UNITED NATIONS, May 6 -- The day after the UN's summary report on Gaza was given to the Security Council and leaked, Israeli President Shimon Peres came to meet with Secretary General Ban Ki-moon and then the Press. He slammed the report for not mentioning the rockets fired by Hamas; he said Israel respects and works well with the United Nations. Inner City Press asked about the UN Relief and Works Agency's repeated complaint that Israeli does not allow them to bring cash into the Gaza Strip, and also that taxes and fees are imposed on them contrary to international law. Video here, from Minute 9:43. President Peres responded that "I don't begin to understand the question. If Hamas didn't fire, there would not be a single cartridge shot from Israel." Inner City Press followed up, emphasizing that the question was about access to cash by and taxing of UNRWA. 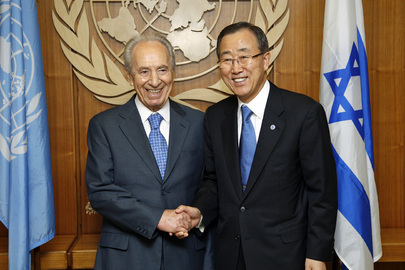 "We support UNRWA all the time," Peres answered. At the UN's noon media briefing minutes later, Inner City Press asked Ban Ki-moon's spokesperson if Ban had raised either issue in his meet with Peres. "Not in this meeting," the spokesperson replied. Video here, from Minute 29:03. Could she provide an update from UNRWA on the issues of cash and taxes? She said she would, and we will report on it upon receipt. Immediately following Peres' media availability at the stakeout, an Al Jazeera reporter who had posed a number of questions was asked to show his UN identification card. He took umbrage, asserting that he was only being asked because of his questioning of Peres. Others pointed at the heavy presence of UN and Israeli security officers at the stakeout, including in the "pit" with the journalists. The one question asked in Hebrew was not about Gaza or the UN report, but rather about the nuclear non proliferation treaty. Inner City Press posed the same question to Rose Gottemoeller, the US representative to the NPT meeting on which we intend to report soon. Watch this site.